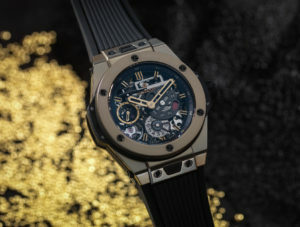 After having examined the 5,500 creations of participants from 54 different countries, a jury of 40 professors, journalists and independent designers chose to give the highest distinction of the Red Dot Awards: Product Design, “the Red Dot: Best of Best 2017” to the Hublot Big Bang Meca-10 Magic Gold watch. The Red Dot Award is a competition organised by Design Zentrum Nordrhein Westfalen in Germany. It was created in 1955 by rewarding for the first time the most worthy designs of the period. Since the nineties, Professor Doctor Peter Zec has taken this institution to the top at an international level. A Red Dot Award is like an Oscar in the film world, it is the ultimate award. This prize acknowledges the immense work that went into the development of the Meca-10 Magic Gold model, a concentration of the best of what Hublot has to offer in high-quality watchmaking, technique, innovation and aesthetics. This watch achieves the exploit of balancing the retro and the futuristic. Retro, like the construction game its name refers to. A return to childhood, when imagination ruled: the Meca-10 is a homage to all those who spent hours designing and building with Meccano. Plates, wheels, gears… it’s all there, but pushed to unseen technical limits that made it possible to perfect a new manufacture movement with an outstanding architecture. Futuristic, like the HUB1201 manufacture movement: fully developed by Hublot’s teams, it has 223 parts and is fitted with two going barrels operating in parallel. 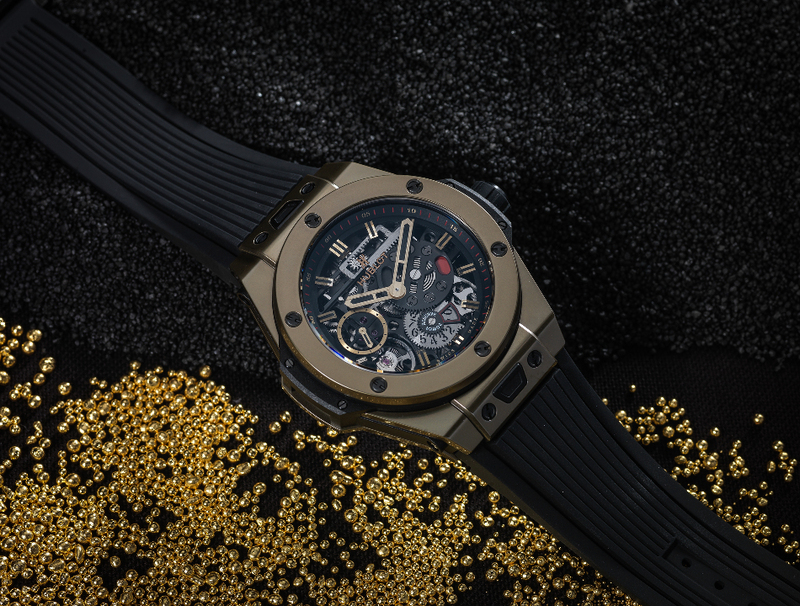 The power reserve indication, which goes up to ten days, works on a rack system. 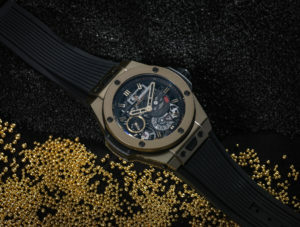 It is also futuristic because of the innovative material used for its case, Magic Gold. 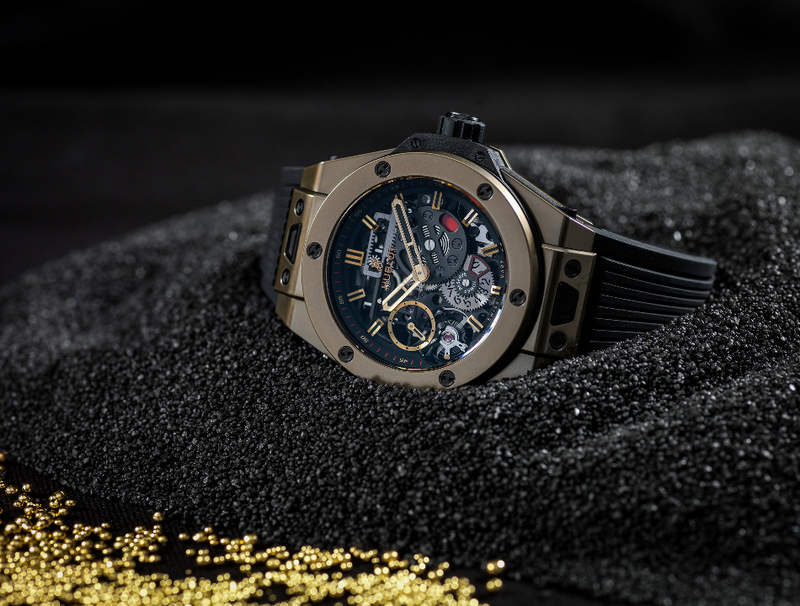 The fruit of a research and development partnership between Hublot and EPFL (Ecole Polytechnique Fédérale de Lausanne), Magic Gold fuses gold with an alloy of ceramics, making it the only truly scratch proof 18 carat gold. Technically, only a diamond can mark it!